Samsung teased the Gear S2 smartwatch at the end of its press conference a few weeks ago and has confirmed we'll see the device in full at its September 3 press conference at IFA 2015 in Berlin. Someone has now dug into the source code of the Samsung site to find there is also mention of a Samsung Gear S2 Classic version, suggesting there'll be at least two versions of the new smartwatch. In early 2014 Samsung released two versions of the same smartwatch, the Galaxy S2 and the Galaxy S2 Neo, so there's every chance it could do the same again. The Classic title suggests a more premium design in the style of the LG G Watch Urbane, which might help Samsung take on the Apple Watch's more premium models. There might also be a difference in connectivity, much like how the LG Watch Urbane and Urbane LTE differed. 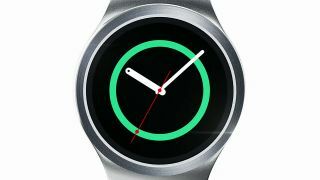 We suspect both watches will be running Tizen software though – Samsung doesn't seem interested in the Android Wear watch game at all right now. All we know about the Gear S2 so far.